Some freaks of nature are fun and interesting. Take 4-leaf clovers, for example. It is estimated that there are 10,000 3-leaf clovers to every 4-leaf clover, making the 4-leafers a bit of a stand-our freak in the clover field. Clovers can also have 5, 6 and even more leaves. The record, in fact, appears to be 21 leaves on one clover (I recently found a 6-leaf clover while visiting Michigan and have added it to my collection of 4 and 5 leaf specimens.) It is debated whether extra leaflets on clovers are caused genetically or environmentally. Their relative rarity suggests a possible recessive gene, a somatic mutation or a developmental error of environmental causes. Variegated plants are another form of nature freak. In layman’s terms, variegations in plants are created when chlorophyll (the substance that makes leaves green) is absent in part of the leaf. The variations in color are caused by whatever pigments are present in the leaf where chlorophyll is absent. White areas in foliage means no chlorophyll and nothing to replace it. Yellow patches means no chlorophyll but the presence of xanthophyll. Other colors are created by the presence of a substance called anthocyanins in combination with either chlorophyll or xanthophyll. Of course, scientists, horticulturists and others out to make a buck have learned to imitate these natural mutations so that four-leaf clovers and variegated cultivars of almost every plant species are readily available. But did you know that the chemicals you use in your garden could also be creating freaks of nature? But they aren’t the kind of freaks that add fun or beauty to the world. Scientific studies have shown that landscape chemicals which find their way into local waterways may be causing deformities in fish, frogs and other animal species. One way that these deformities show up is by creating intersex fish. Intersex is a condition in which fish may exhibit characteristics of both sexes, such as male fish producing eggs. Intersex specimens of smallmouth bass and other fish have been found inmany states, including both Virginia and Maryland. Frogs and other amphibians also seem to be suffering the effects of pollutants. Frogs with deformed limbs have been found in almost every state and many amphibian populations are suffering. The problem is so extensive that the U.S. Fish and Wildlife Service declared 2008 the Year of the Frog to help emphasize what everyday citizens can do to help correct the problem. You may not think that you can make a difference, but caring for your lawn in an environmentally sensible way can have a bigger impact than you might think. You can help keep the environment clean and the frogs healthy by following these simple tips. If everyone does their part to protect the environment, all types of fish and wildlife, including frogs, will enjoy a cleaner, healthier environment. Mulching, spading, hoeing and pulling up weeds are good ways to avoid weed growth rather than applying weed killer. 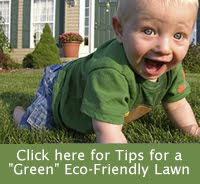 * Leave the grass clippings from mowing to decompose on your lawn (feeding your lawn this way is equal to fertilizing it once or twice a year). * Use compost in your garden to develop healthy soils and reduce the need for chemical fertilizers. * Have your soil tested to find out exactly what nutrients it needs in order to avoid applying unnecessary fertilizers. Your County Agricultural Extension Service will test your soil for a reasonable fee. * Use organic fertilizers rather than synthetic ones. Organic fertilizers release more slowly into the environment and create healthier soils. * Apply fertilizer when the soil is moist and then lightly water. This will help the fertilizer move into the root zone instead of blowing or washing away. However, be sure to check the weather forecast in order to avoid applying fertilizers immediately before a heavy rain which may wash the fertilizers into the nearby streams. * Calibrate your applicator to make sure you apply the correct amount of fertilizer. * Minimize the attraction of pests such as rats, therefore reducing the need for pesticides, by moving wood piles away from the house and clearing away litter and garbage. * Plant native grasses, shrubs, and trees. Native plants are often hardier than non-native plants and less susceptible to pests and disease. * Put an assortment of plants in your yard to increase biological diversity and encourage a variety of beneficial organisms that provide natural pest control. * Rotate the plants in your annual garden. Changing the type of plants you grow each year makes it harder for pests dependent on a certain type of plant to become established, and therefore, eliminates the need for pesticides. * Grow plants that are natural insect repellents, such as lemon balm, among your flowers and vegetables to help keep unwanted insects away. * Keep litter, pet wastes, leaves, and debris out of street gutters and storm drains. These outlets drain directly into lakes, streams, rivers, and wetlands. Pet wastes contain bacteria and viruses that can threaten fish, wildlife, and people. * Never dump oil, antifreeze, or other household chemicals into storm drains or sewers, down the drain of your sink, or into the toilet. Contact your local Solid Waste Management Office to find out how to dispose of these materials properly. One thing that was not mentioned in the article is the benefit of using rain barrels, permeable surfaces, rain gardens and other methods to help cut down on stormwater runoff which is what washes all of these chemicals into the waterways in the first place. Taking any of these steps will help you do your part to keep the planet a little less freaky!